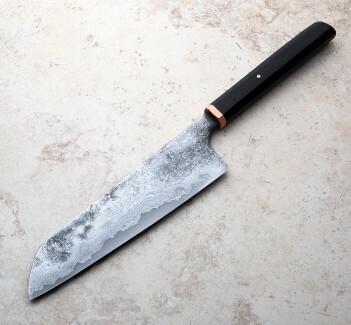 A gorgeous full-size, full-dress 245mm chef knife handmade by Tobbe Lundström of Sweden. The proprietary method Damasteel uses to create their incredible Damasteel patterns makes the steel ideal for kitchen blades and Tobbe uses it almost exclusively in his custom chef knives. 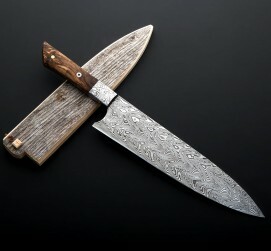 With hand-forged Twist pattern Damasteel bolsters and beautiful birch burl handle with mosaic and brass pins, this piece truly has all the bells and whistles, so to speak. 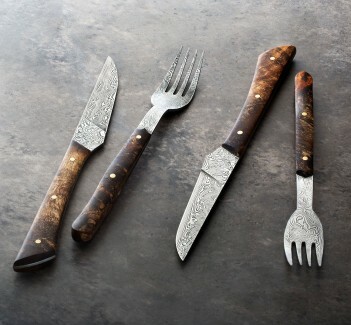 A reclaimed wood saya with hand-carved reindeer antler pin is included. 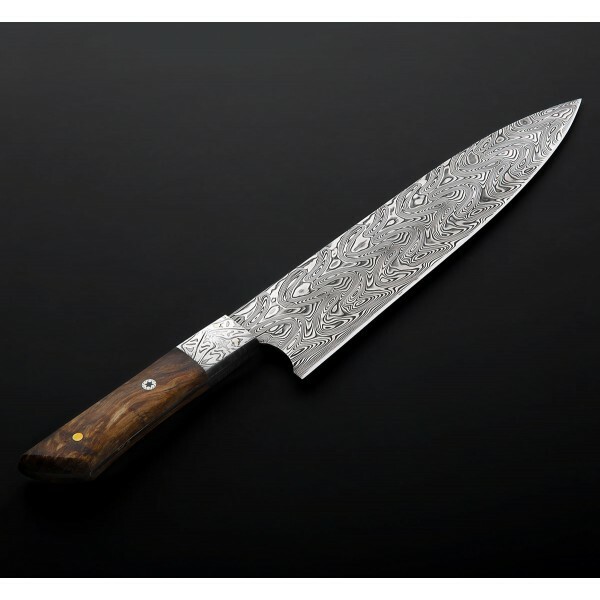 With 245mm (9.6") of edge and weighing 9.2oz (260g) this is a full size chef knife / gyuto workhorse designed for daily use and long hours in the kitchen, despite the temptation you might have to display is behind glass. Tobbe Lundström creates handcrafted chef knives at his one-man shop in Åre, Sweden, with a focus on full-size chef knives, slicers and stunning Damasteel cutlery sets and dinner knives. This piece from Tobbe is as fine as they come. Blade length: 45mm (9.6"). Overall length: 14". Blade width at heel: 2.4mm. Blade height at heel: 53mm. 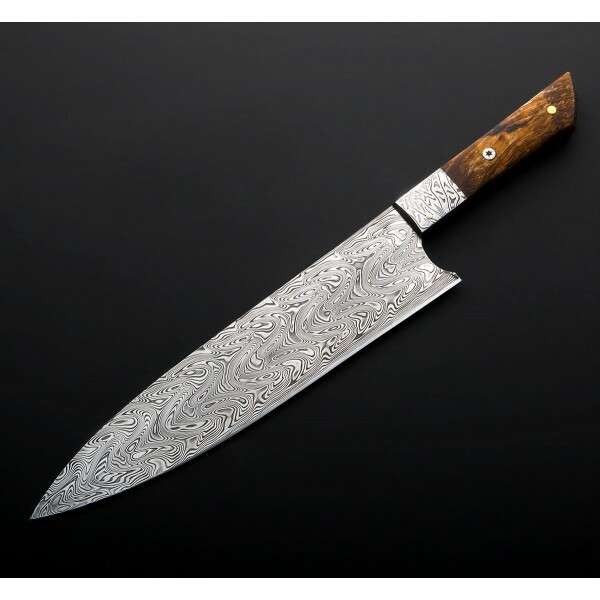 Weight: 9.2 oz / 260 g.
Stainless damascus Damasteel Thor pattern blade. Forged Damasteel Twist pattern bolster. Birch Burl, with mosaic and brass pins. Wooden saya, from reclaimed, weathered barn siding, with reindeer antler pin.